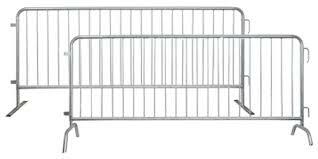 EPIC Steel Crowd Control Barricades are made of heavy duty Hot Dip galvanized steel. Don't just buy from any online crowd control warehouse when you can talk with an expert in crowd control barriers who can help you select the best barrier to suit your needs. Our years of manufacturing experience in steel bike rack barricades and the crowd control industry knowledge is put into all of our steel barrier designs.